What’s this about a Python SEO URL Checker? 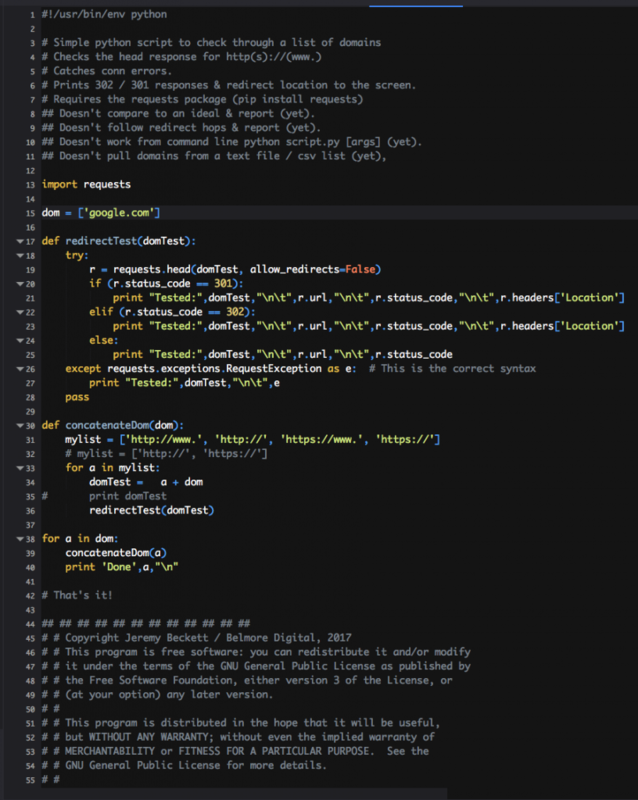 Using my limited knowledge of Python and not-so-limited knowledge of SEO, I crafted this simple little script to do the leg work for me and report back its findings in a readable format which can be slapped straight into an email that even devs can understand (j/k). As I say above, I got very bored checking domain redirects for a client with a whole bunch of domains and sub-domains. This script uses the requests package, does a head request on a list of domains for each variant of http(s)://(www. )domain.com, lists out the responses if they are 301, 302, or 200 and if it gets a connection error, it spits out the details. It’s rough code. I don’t code for a living, but I do occasionally code to make my life easier. This little beauty has already saved me minutes & hours. It comes with no warranty, express or implied, and no support. That said, if you have any ideas, or improvements, I’m all ears. Feel free to use it & redistribute, but please leave my details intact. as you can see. (It’s in image format as WordPress wraps without leaving indentation intact. The image links to the python file in text format. 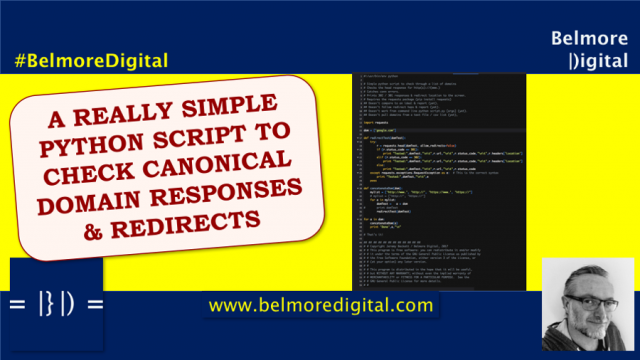 A python script to check canonical domain redirects. As you can see the naughty people at Google 302 redirect (!) to a different country domain (!!). The 302 redirect isn’t great, although Google is moving towards “all redirects are equal”, but redirecting based on IP address? No, no, no, no. Naughty Google! Let the user go where they want to go! When testing my domain, all redirects go via 301 to point to a single, canonical variant of the domain, which is what you want. Got bored of repeatedly checking stuff, wrote a little Python script to check if http(s)://(www.) redirect to a canonical variant of a domain. It’s GNU GPL, so feel free to use it, redistribute or modify, but I’d appreciate it if you left the contact details intact. If you do make it better, please let me know! Thanks for reading. 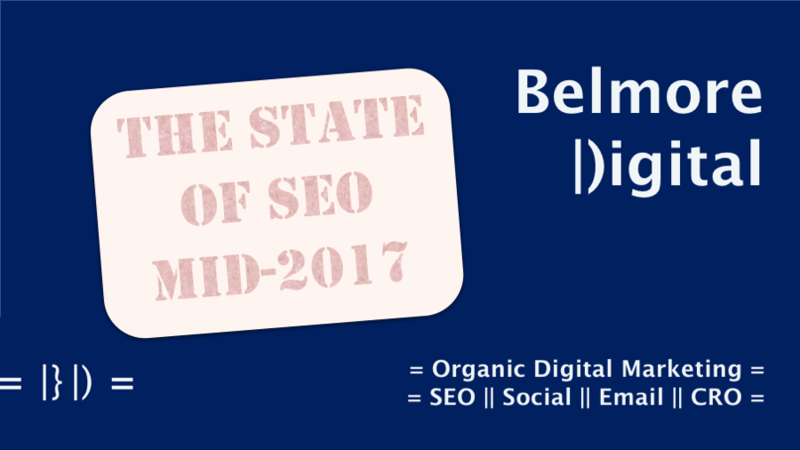 If you would like to discuss SEO, or the weather, please feel free to contact me.